The yearlong Desert War in the wasteland of Western Egypt and East­ern Libya had reached a stale­mate in May 1942, with both Allied and Axis sides licking their wounds. The fighting started four days after Benito Mus­so­lini’s Italy declared war on Great Brit­ain and France in June 1940. Egyptian-based Brit­ish forces crossed into Libya, where the Ita­lians had been a presence since 1911–1912, and captured a fort just over the border. This was followed by the Italian Tenth Army pene­trating 60 miles into Egypt and capturing a Bedouin camp that September. Oper­a­tion Com­pass (Decem­ber 9, 1940, to Feb­ru­ary 9, 1941), a Brit­ish Common­wealth counter­offen­sive, put an end to the adven­turous Tenth Army. 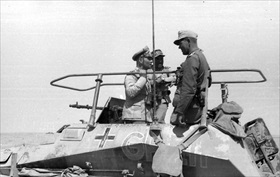 Mus­so­lini’s Axis part­ner, Adolf Hitler, dis­patched the Ger­man Afrika Korps under Lt. Gen. Erwin Rom­mel to Libya to prevent a complete Italian meltdown. On this date in 1942 “The Desert Fox,” Rom­mel’s nick­name in the Brit­ish media, led his Afrika Korps in assaulting the Allies’ Gazala Line east of Tob­ruk in East­ern Libya. One month later, on June 20–21, 1942, Tob­ruk was Rom­mel’s, along with 33,000 Brit­ish and Common­wealth pri­soners. Egypt and the Suez Canal—Brit­ain’s watery link to India and its South­east Asian colo­nies of Burma, Malaya, and Singa­pore—appeared up for grabs, and pas­sage to the Middle Eastern oil fields—vital to both sides—appeared open, too. Above: Map of Cyrenaica (Eastern Libya) and Western Egypt, 1941. The Western Desert Cam­paign, also known as the Desert War, took place in this harsh desert area lightly popu­lated with noma­dic herds­men except along the coast, where there were sev­eral forti­fied settle­ments, one being Tob­ruk with its deep, natural, and pro­tected harbor (center in map). The see­saw struggle lasted from June 1940 until early February 1943, though Axis forces had shifted into permanent retreat in mid-November 1942. 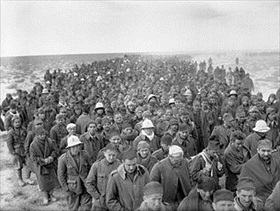 Left: A column of Italian prisoners captured during Oper­ation Com­pass (Decem­ber 9, 1940 to Febru­ary 9, 1941) march to a Brit­ish army base. In two months of com­bat the British Eighth Army cap­tured nearly the whole of the Ital­ian Tenth Army, taking 130,000 pri­soners and almost 400 tanks. When Erwin Rom­mel arrived in Libya at the head of the Ger­man Afrika Korps in February 1941, the Ital­ians had just 7,000 sol­diers in Eastern Libya. Right: A column of Panzer Mk IIIs of the Ger­man Afrika Korps moves up a desert road, March 21, 1941. On March 24 Rom­mel launched a limited offensive. By early April, after much of the Brit­ish Army in North Africa had left to sup­port Greece against Mus­s­olini’s inva­sion of that coun­try, Rom­mel retook Ben­ghazi, capi­tal of Cyre­naica (East­ern Libya), and pressed on toward Egypt, having secured all of Libya with the excep­tion of the stra­te­gically impor­tant port of Tobruk by April 15, 1941. Tobruk remained besieged from land, sea, and air until December 1941. 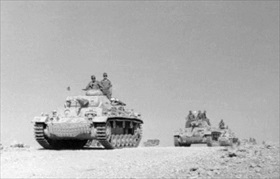 Left: Rommel’s second offensive in Eastern Libya against Brit­ish and Common­wealth troops, nick­named “The Desert Rats,” took place in May and June 1942. Here Rom­mel can be seen on the left with his chief of staff, Gen. Fritz Bayer­lein (par­tially hidden), as the two men sur­vey the land­scape from Rom­mel’s com­mand halftrack, which he had named “Greif” (Griffin). Both adver­sa­rial armies used the 240‑mile‑wide West­ern Desert of Western Egypt and Eastern Libya as a testing ground in terms of organ­ization, equipment, and methods of waging war. Right: On June 21, 1942, Tobruk fell to Rom­mel (per­haps seen here entering Tobruk in “Greif”). Tob­ruk remained in Axis hands until Novem­ber 11, 1942, when Lt. Gen. Bernard Mont­gomery’s Eighth Army retook it after the Second Battle of El Ala­mein (Octo­ber 23 to Novem­ber 11, 1942). El Alamein revived the morale of the Brit­ish, being the first major offen­sive against the Ger­mans since the start of the Euro­pean war in 1939 in which the West had achieved a deci­sive victory. Tob­ruk remained in Allied hands there­after. 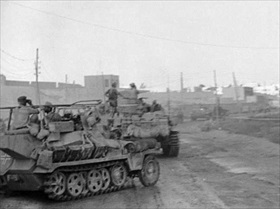 In May 1943 the rem­nants of the Axis forces sur­ren­dered to the Allies from their enclave in Tunisia.